If you’ve been lucky enough to be visiting Naples, Florida when The Collier Collection has been open to the public, then you’ll appreciate the importance of our visit in mid-January this year. 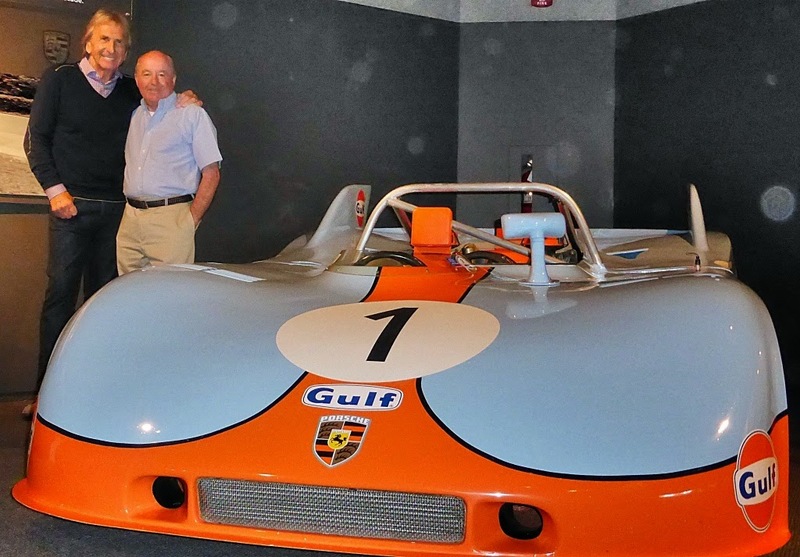 My good friend, racer Derek Bell, arranged a private viewing very early on a Saturday morning with Curator Scott George, so that I and two of my best friends from the USA could see the exhibits up close, and get all the background info direct from Scott. What an experience! The only downside turned out to be my brand new Panasonic Lumix ZS30 digital camera. What a disappointment. I purchased it based on one review, but found that the size of the CMOS sensor was smaller than in my trusty Canon S90 pocket camera. The result was dark and out-of-focus photographs. It has taken me a good long time working with software to recover some depth, clarity and exposure so I can post them here. 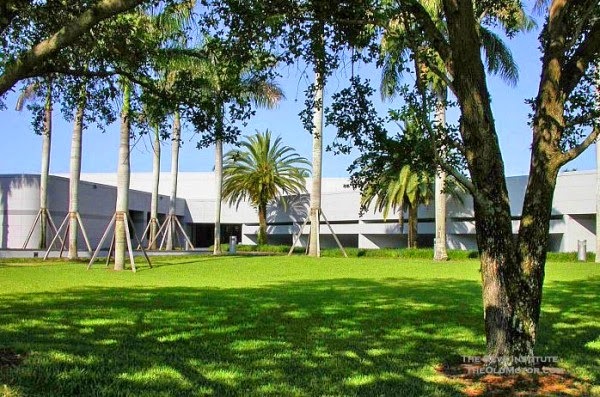 It’s not easy to find The Collier Collection, as it’s in a very plain, unmarked building buried away on an industrial estate at 2500 South Horseshoe Drive, Naples. Entry is by reserve ticket only which you can obtain by calling (239) 687-7387. The Collier Collection is open Tuesdays, Thursday and Saturdays from 10am-4pm, and general admission is just USD$17; If you want to be accompanied by one of the Collection’s excellent docents, it’s just $3 extra. Miles Collier and his brothers were the beneficiaries of inherited wealth, but as a sign of the guiding principles behind the Collection, they devoted much of their wealth to philanthropy. Miles is also a talented painter, and canny investor. The Collier siblings are credited with bringing sports car racing to America in the 1930s; and Miles competed for almost 10 years in his Porsche Speedster. In the late 1980s Miles Collier decided to create a collection of definitively important cars, that is, cars with a specific history, design or achievement. And this is a huge element of the absolute enjoyment of touring the Collection. Every car inside this building has a reason for being there, and the story boards will keep you as entertained and intrigued as the cars themselves. In 1986, Miles Collier acquired the Cunningham Museum collection of longtime family friend Briggs Swift Cunningham, which included the first Ferrari racing car ever sold in the United States, and one of six Bugatti Royales ever produced. 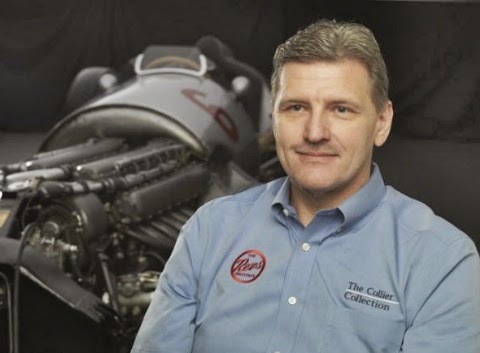 What is now known today as The Collier Collection began to take shape during the late 1980s and 1990s as Miles Collier continued to grow his private collection of the finest, most original examples of sports and racing cars. He soon also became widely recognized for his groundbreaking preservation aesthetic. I cannot speak too highly of the Curator, L. Scott George. 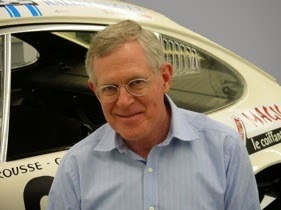 He is not only friendly and affable, but his detailed knowledge of every car in the Collection is breathtaking. The Colliers and Scott George are very lucky to have found each other. I’m sure you won’t be surprised to know that The Collier Collection is still collecting, and what is currently on display is not everything it owns. 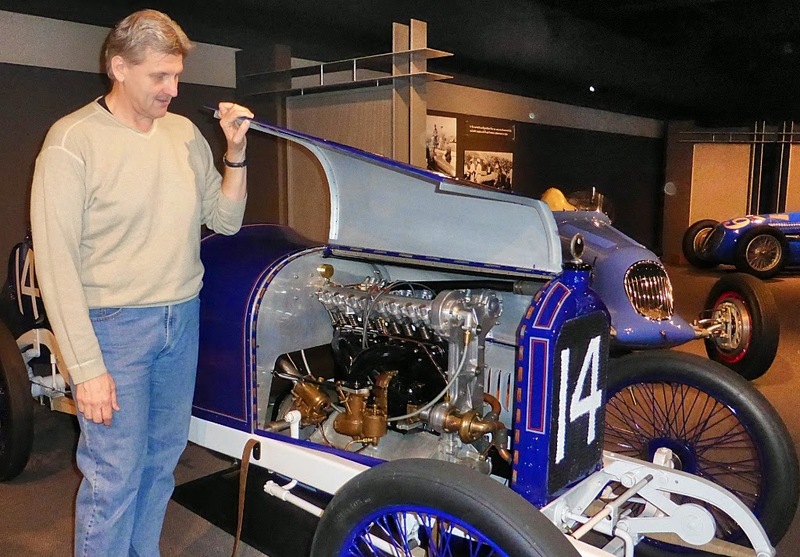 There are many cars in storage and some still being restored, so that Scott can ‘freshen’ the display by rotating exhibits. The cars I photographed and used here have special meaning for me, because they are all cars and marques I have long admired. However, probably the most special is the 1971 Porsche 908/3 raced by Derek Bell, simply because I was there with the man who drove it. 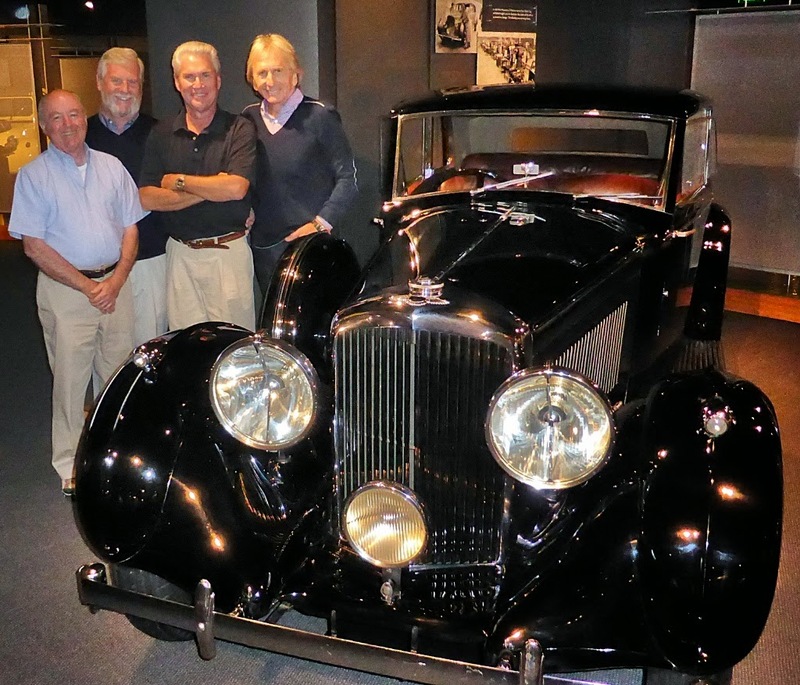 Then, in recognition of the many years I spent with Bentley Motors, our group posed with a 4 ¼ litre Bentley with James Wood coachwork. In some ways, this was a contentious car, because it represented what Rolls-Royce Motor Cars did with the Bentley marque after it acquired the bankrupt company from W.O. Bentley in 1931. Everyone recognized that Bentley’s 4.0 litre straight six was an outstanding engine, but Rolls-Royce engineers increased its capacity and smoothed the rough edges to create the 4 ¼ litre version, which powered more than 2500 Rolls-Royces and Bentleys – the Bentley version was known as ‘The Silent Sports Car’. By the time this car was released W.O.Bentley had tired of working as a ‘consultant’ for Rolls-Royce, and had moved on to Lagonda, to create another great engine for that company. Next I turned my attention to Peugeot and Alfa Romeo. I worked with Peugeot for almost 10 years, and when I was delving into the company’s fascinating and trend-setting history, prior to the 1988 launch of the Peugeot 405 Mi16, I discovered the modern DOHC 16-valve car had an impressive distant relative 75 years earlier! 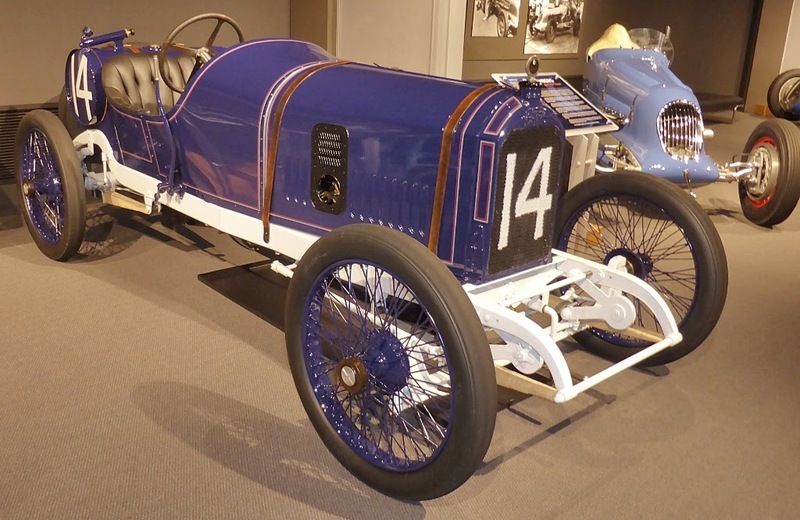 In 1913 Peugeot decided to participate in the Indianapolis 500 and presented a ‘baby car’ up against 6 & 8-litre behemoths which were common at ‘The Brickyard’. The car had a 3.0 litre inline four cylinder engine, with twin overhead camshafts and four valves per cylinder. Entered privately by the owner of a French chocolate company, the Peugeot smashed the lap record and led most of the race, with the driver (having made his point) backing off for a ‘comfortable second’ behind the winning 6.0 litre Delage. 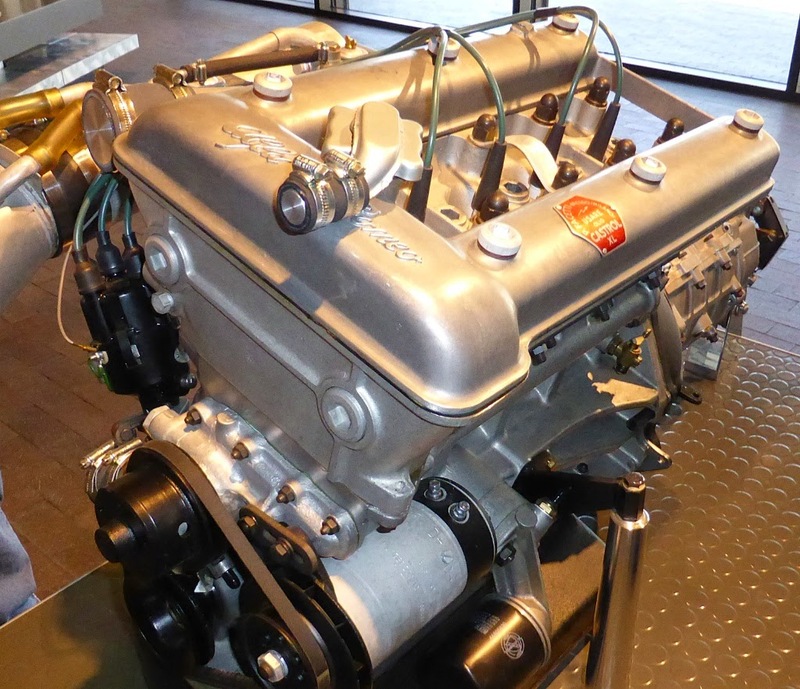 Race reports at the time marveled that the Peugeot engine was a mere 6 cubic inches larger than the Ford Model T! I’ve written before about the wonderful designs which Bertone produced to help build the Alfa Romeo legend for creating beautiful, sporty cars. 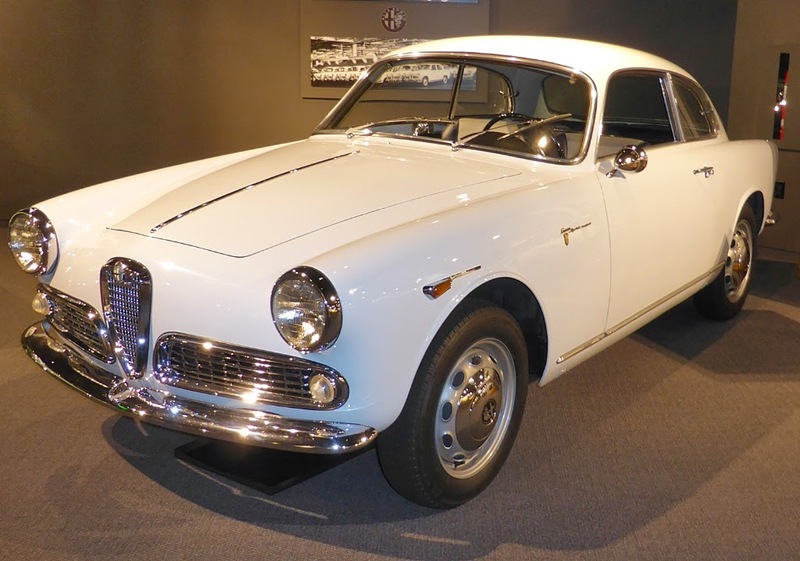 The 1958 Giulietta Sprint Veloce was the car which launched the former racing company into volume production, and the rest is history. Next I spotted a beautiful racing coupe designed by Zagato, the 1964 GTZ. 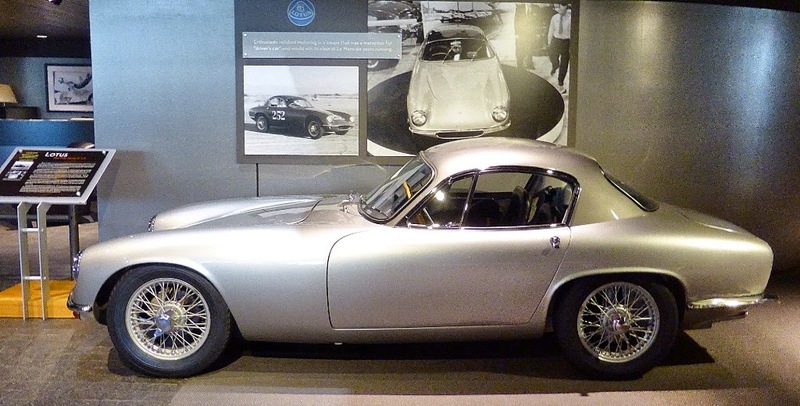 Back in 1951, owing to lack of cash, Alfa Romeo closed its competition department, Alfa Corse, but its engineers created a skunk works in concert with Zagato. 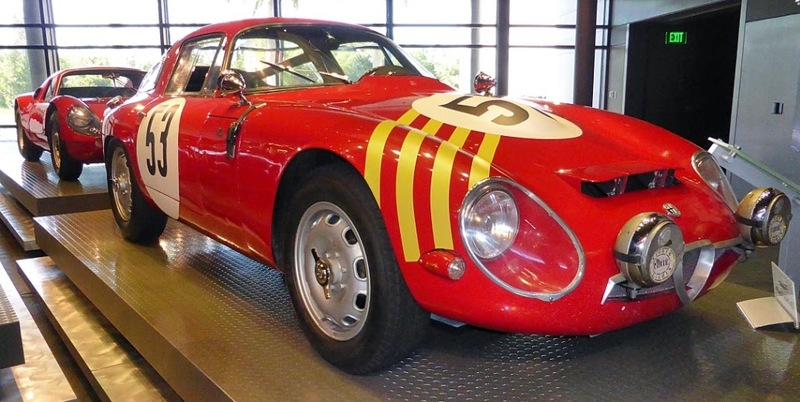 In 1963 they created a purpose-built, alloy-bodied racer, the Giulia Tubulare Veloce. 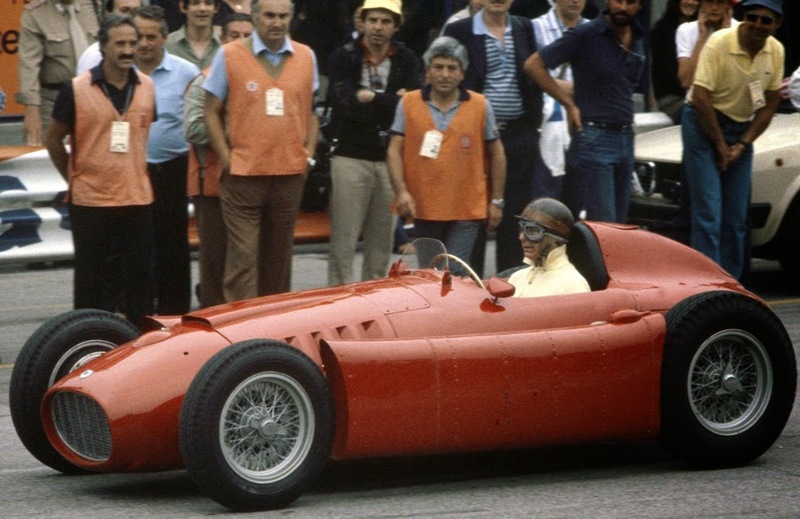 Also in 1963 Alfa Romeo had decided to support a racing company called Auto Delta, headed by ex-Ferrari wizard, Carlo Chiti. Chiti produced the magic again with the GTZ winning the 1600cc class in the 1964 Sebring 12 Hour race, up against an Abarth-Porsche, Jim Clark’s Lotus Cortina, and two Lotus Elans. 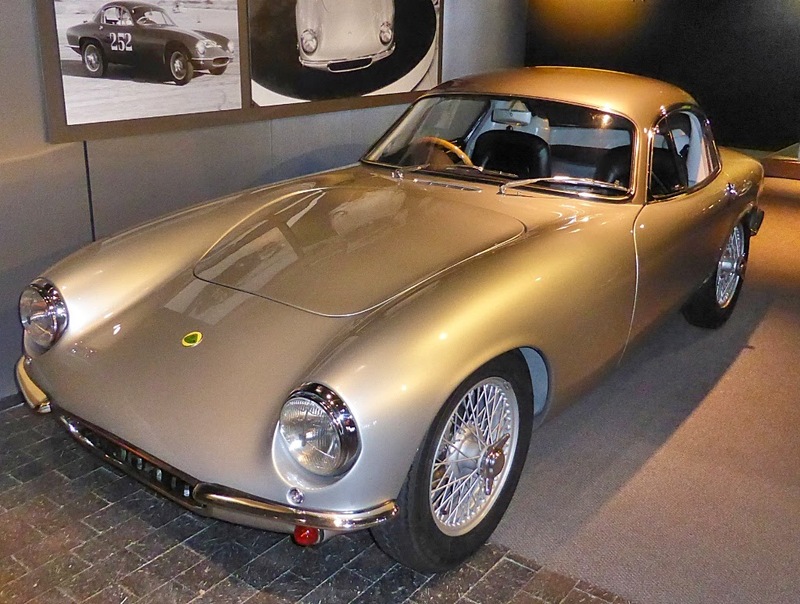 Speaking of Lotus, the Collier Collection has a beautiful 1962 Lotus Elite Series II SE. The Elite was probably the single most important creation by Colin Chapman at the time. I've been in love with the Lotus Elite since I first saw one racing in Australia in 1963. The original 1957 prototype, which received rave reviews, was designed by Peter Kirwin-Taylor (an accountant who ‘liked to draw cars’), and refined by aerodynamicist Frank Costin. The car featured a stressed roof design, which precluded an open version, but the GT coupe was light, slippery and a beautiful car to drive. Elites won their class in the Vingt Quatres Heures du Mans six years running! Despite its popularity among enthusiasts looking for the ‘ultimate sports car’ Lotus lost money on every Elite GT it sold. 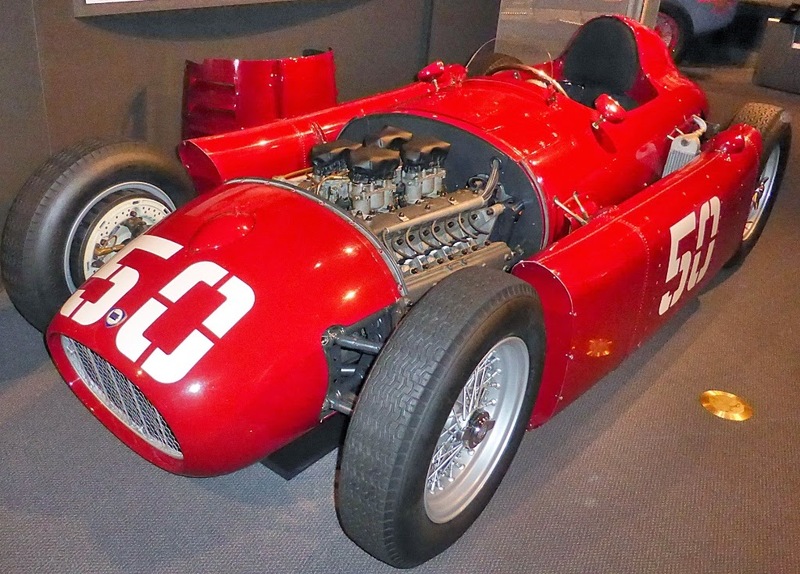 I’ve long been a Lancia fan and the gorgeous quad-cam 2.5 litre V8-powered D50 Formula One car of 1954 was notable for being the race winner which destroyed the company. 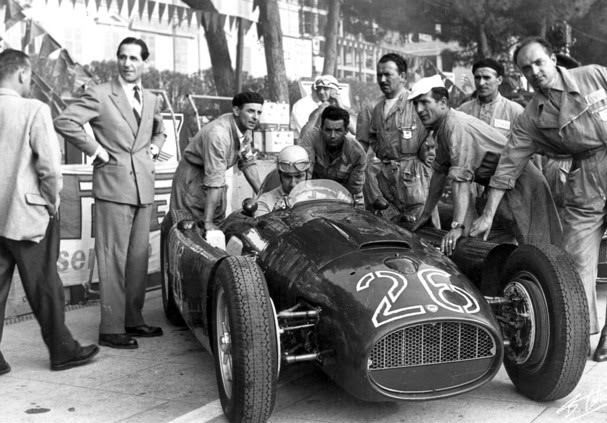 In its race debut at the 1954 Spanish GP, twice World Champion Alberto Ascari put the Lancia on pole. He won two grands prix in 1955 and was leading in Pau, when he crashed into the harbor. The Lancias were the only cars feared by the dominant Mercedes-Benz Silver Arrows team, and its drivers Stirling Moss and Juan Manuel Fangio! Gianni Lancia spent so much money on this beautiful racer, designed by Vittorio Jano, that it bankrupted the company, and all its designs including the D50 were handed to Ferrari! The car was notable for its side pannier fuel tanks, which concentrated the fuel load inside the wheelbase, plus its asymmetric placement of the drivetrain where the driver sat beside the prop shaft feeding power to a rear mounted transaxle gearbox. It was a truly inspired layout. 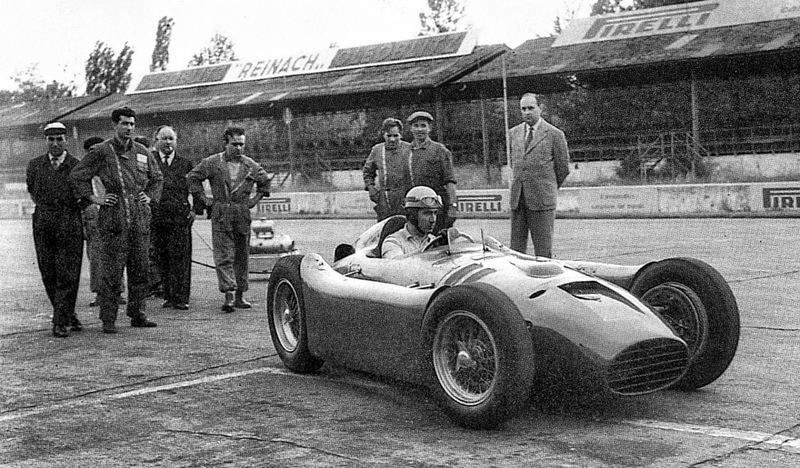 Juan Manuel Fangio won the 1956 world title in the D50a Ferrari-Lancia derived from the original car! True car enthusiasts the world over should try to visit The Collier Collection. There a great many private collections around the world, but for me, the fact that each exhibit tells a special story, makes The Collier Collection hard to beat. My sincere thanks and those of my friends go to the Collier’s spirit of generosity and their love of cars which is willingly shared with the world, plus Scott George for his wonderfully informal imparting of knowledge, and of course Derek Bell for arranging the visit. * This is a very long, and very self-indulgent post, but because of the time it has taken to prepare the photos, and the special significance of the visit, I wanted to give it the prominence I think it deserves, and you might enjoy some of the stories and photos I have been able to capture. Naturally, there are many more special and more important cars in the Collier Collection, these are just my favourites.